As pledged to the members of Star Garrison many moons ago…. strip #1002 is another shout out to the 501st. Guess you can even call it a continuation of strip #501. I just can’t say enough about the awesome men and women who use their obsession for Star Wars to do so much good for so many. They donate their time, money and talents to help those who are less fortunate and in need. Thank you to all the members for all the hard work you do! I would also like to thank many of you for all the support you’ve shown for Yak’s Pub over the years. Several of you have been inspiration for strips, posed in picture for me, and just put up with me in general. Here’s to many more adventures with the 501st…. salute! What – No love for the Rebel Legion as well? 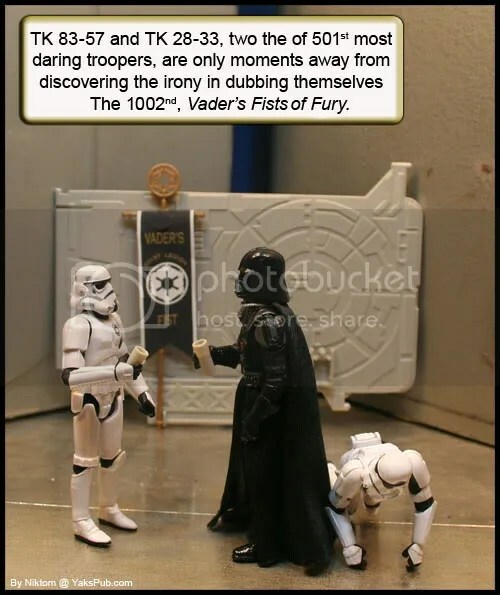 We are the “Good Guys” and do the same thing as the 501st. Yeah, but there’s something about a man in a suit of armor. Thanks for the shout out, Scott!